Students gather to form the "Pi" symbol, a Greek letter. In case you are wondering, the date comes from the first three digits of Pi: March is the third month, followed by the one and four that make 14. Today marks the 28th celebration of Pi Day to honor the most famous irrational number, which has no end and shows no pattern. What better represents Pi than a round pie? Pi appears wherever there are circles. Pi is a ratio. It measures the distance around a circle to its diameter. The diameter is the distance from one side of a circle to the point directly opposite in the circle. A website, Piday.org, showcases little known facts about the number. Pi has been known for thousands of years and gets its name from Greek letter, Pi. The Greeks are believed to have used the letter to describe the ratio. They did not have Arabic numerals to calculate it however. The first Pi Day was celebrated on March 14, 1988. San Francisco’s Exploratorium science museum started the event, according to the site. The museum marks the day with a daylong celebration including a parade, and something more substantial, real, edible pie. March 14 has other scientific links. It is the birthday of physicist and Nobel Prize winner Albert Einstein. Princeton University, where Einstein lived for many years, marks Pi day, as well. Mario Ritter adapted this story for VOA Learning English. Kathleen Struck was the editor. 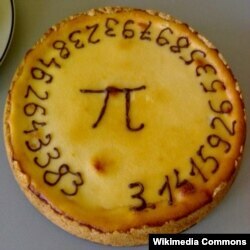 Did you celebrate Pi Day? Do you love math or geometry? Please leave us a Comment and a post on our Facebook page. Secret to Life? Dance, and Don't Procrastinate!